With the holiday’s getting in full swing, that means some busy days and nights with lots of running around. I am excited to share one of my favorite snacks on-the-go with you that will help you stay feeling full and satisfied for hours to come. 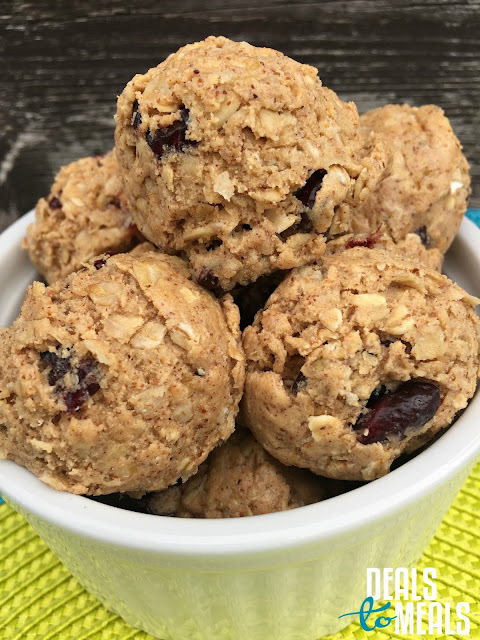 Instead of snacking on processed snacks full of sugar and fat, these protein balls are the perfect solution for you and your family to enjoy all day long. I keep these in my freezer so I can have them on hand anytime we need. If you want another version, here’s our recipe for Peanut Butter Protein Balls which are also great. Hope you enjoy! In a large mixing bowl, mix together with a spatula the honey, protein powder, and almond butter. Once the mixture is smooth, add the oats and continue to stir. Then add the chia seeds (or milled flax seeds), dried cranberries, salt and vanilla. Mix until combined and the mixture is somewhat firm. Spray a cookie sheet with nonstick cooking spray. Spoon tablespoon portions onto the cookie sheet and roll into a ball. Place the tray in the freezer for several hours. Once the balls are frozen, place them in a large gallon sized ziploc bag. Keep in the freezer for up to six months.